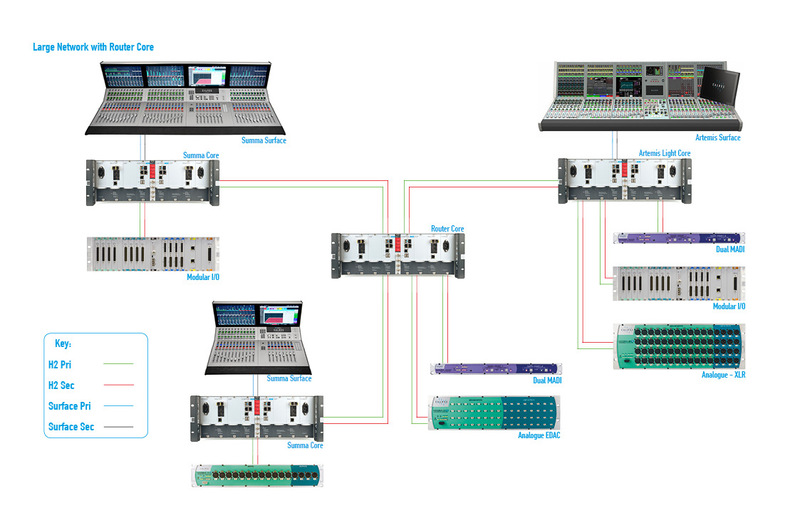 Hydra2 provides seamless, scalable audio networking of audio mixing consoles with routers and I/O interfaces, allowing for a large numbers of inputs and outputs to be shared and controlled irrespective of location. 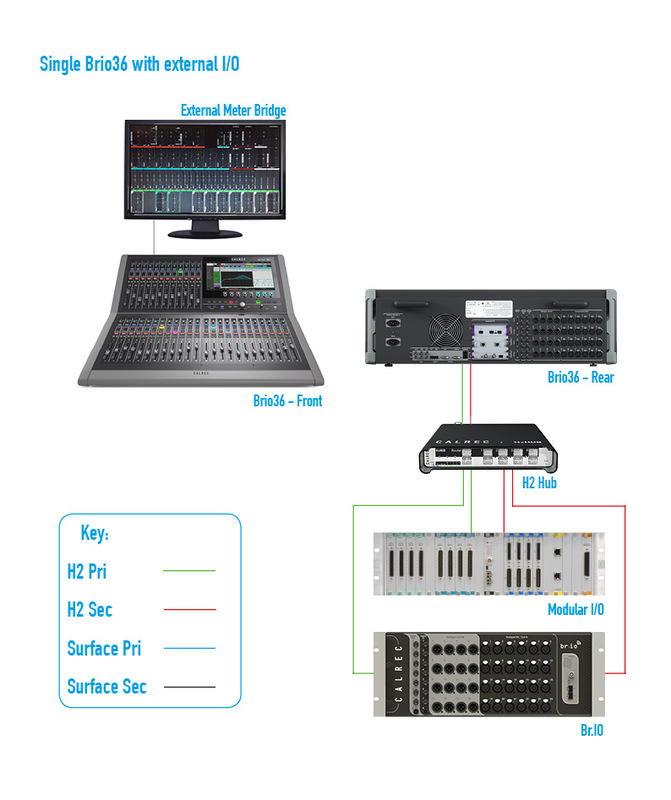 Hydra2 provides seamless, scalable audio networking of audio mixing consoles with routers and IO interfaces, allowing for a large numbers of inputs and outputs to be shared and controlled irrespective of location. Hydra2 does not compromise audio quality, performs with negligible latency and is founded on comprehensive, built-in fault detection and redundancy. Many of the world’s most successful broadcasters rely on Hydra2 infrastructure for live on-air application in both fixed and mobile installations every day. Calrec’s networking protocols provide seamless, scalable audio networking infrastructures which allow for large numbers of inputs and outputs to be shared and controlled regardless of location. Whether on Hydra2 or over IP, Calrec makes connecting and managing resources very straightforward. Calrec’s dedication to the AIMS roadmap ensures transport protocols such as AES67, Dante and Ravenna continue to evolve and in doing so gives greater interoperability choices to its customers. Calrec provide a range of fixed format IO boxes to provide the quantity and type of signal format required where it is needed. Each type of fixed format IO box contains a set number of inputs and outputs, all of the same type/signal format. ModularIO BOXES are 3U rackmount enclosures with 20 x IO card slots that can be populated with a mixed range of IO cards, allowing for a custom selection of IO quantities and formats. Modular IO boxes connect to a Hydra2 network in the same way as Fixed Format IO. 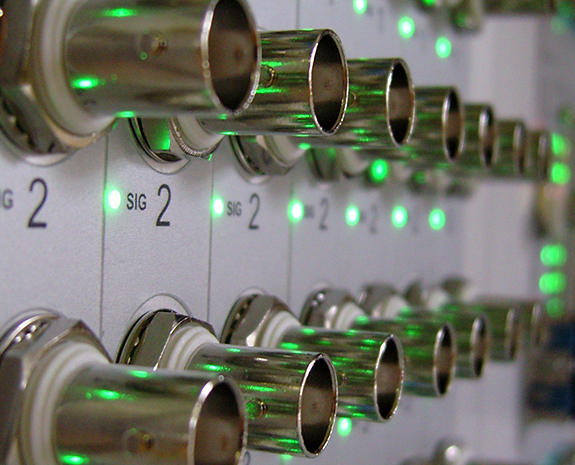 Multiple IO boxes can coexist on a Hydra2 network alongside fixed format IO, if required, in order to make up the quantity of IO in the format and location needed. The Fieldbox is a portable IO box which provides 8 x balanced analogue mic/line level inputs, and 8 x balanced analogue line level outputs, in a compact, cost-effective package. The Fieldbox functions just like any other Hydra2 IO box, providing remote control over input settings that utilise Hydra2’s sharing, protection and access management system, along with active status monitoring and a backup Hydra2 network connection. The H2Hub provides a network distribution node that can be used to connect from a router up to 4 x external connections which may be IO boxes or other Hubs to form a local array of IO connectivity. A single connection from any router can be switched via the H2Hub to multiple IO units, and even another H2Hub if further IO distribution is required – in fact 3 x H2Hubs can be daisy-chained together. Br.IO is a 4U Hydra2 based external IO Rack allowing for cost effective expansion of IO for use with Brio and Summa consoles. This rack has the same complement of analogue and digital IO that can be found in a Brio 36 system. For a complete overview of our range of Hydra2 equipment, visit our Resources page to download our Product Brochure, or for more detailed information login to download our Hydra2 Installation Guide. 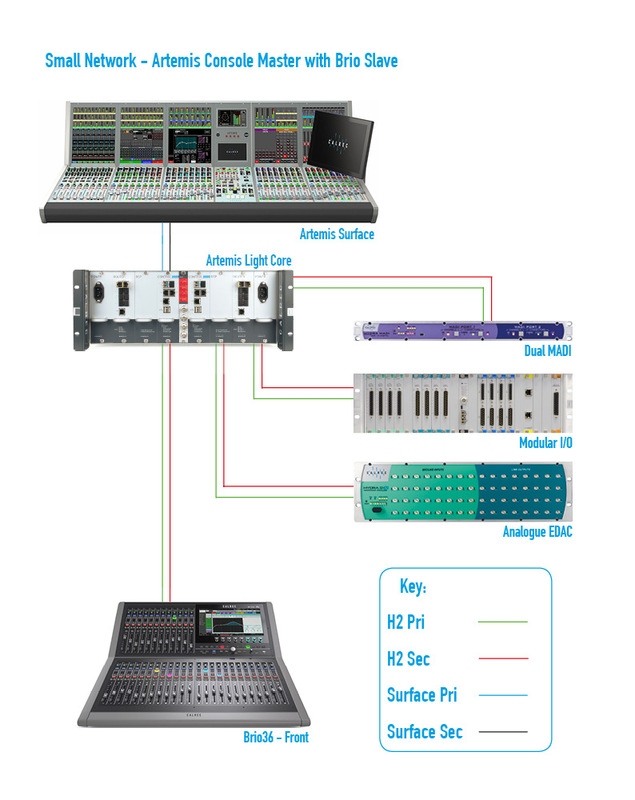 The Calrec Audio over IP unit provides a Hydra2 AoIP interface carrying up to 512 x 512 channels using AES67/ Ravenna and or AVB modules. The unit can accommodate two modules AoIP 1 & AoIP 2 and may be fitted with one or two 256 x 256 channel AES67/ Ravenna or AVB modules, or one of each type as required. In addition to the standard Hydra2 redundancy each module also has both a primary and secondary 1GB IP connection, supporting hitless switching for redundancy. IP Stream management is achieved through a WEB UI. A pair of rear mounted SFP slots provide primary and secondary connections back to routers in a Hydra2 network. Primary and Secondary SFP slots are also provided for the 2 x AoIP ports and indicators are provided on the rear to show which modules have been fitted to the unit. The AoIP unit must be given an ID which is unique on the network, before being connected. The ID is a value from 1 to 256, set as a binary representation using DIP switches accessible from the rear. The AES sync O/P on the rear of the unit provides a PTP clock reference derived from the Internet stream. Note: this sync O/P is not yet enabled as of 01/09/16. The System OK LED strobes every second to indicate that the system is actively talking to the AoIP modules and the Hydra 2 interface. or every 100ms if the Hydra 2 interface is not active. A Cat 5e connector on the front of the unit is used for Setup via a WEB UI. A recessed Reset button allows the user to reset the system. A Red Fan Fail LED illuminates if the fan stops spinning. Next to this are the 2 PSU LEDs which illuminate green to show they are ON. The Hydra2, AoIP 1 & AoIP 2 primary and secondary interface LEDs illuminate to show they are connected.